Journey by train and bicycle to the serene town of Tigre during this 6-hour tour from Buenos Aires. With your cycling guide, board a train bound for the Argentinian countryside, passing the green expanse of Palermo Woods and the presidential residence at Olivos. In Tigre, which lies on the Paraná River delta, ride your bike down an easy path along the river. 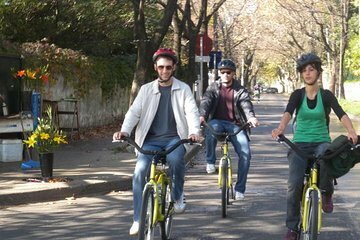 Pedal through the historical quarter of San Isidro and into the Natural Reserve. Use of all equipment is included. This will be a highlight of your BA trip. We had Brian who owns the business guide us and he is knowledgeable and passionate about BA and Argentina which makes the tour even more valuable. This will be a highlight of your trip, is not arduous and has plenty of time for you to enjoy all that the area has to offer. I recommend you book this trip to see another side to BA.